How quickly and thoroughly a service company responds to your emergency service call is what truly differentiates the best heating and cooling companies from the rest. We take great pride in responding immediately, 24/7, to all emergency calls. We always deliver honest and straightforward recommendations. Our focus is earning your trust and business, both now and down the road. We are not in the market of selling you something you don’t need. We’re in the business of extending the life of your current system, to save you time, money and hassle. When your home heat pump or furnace goes down, rest assured: You can count on us. When the heat goes out on a freezing winter night or when the air conditioning fails you on a crazy hot day, nothing is more important to you than fixing the problem asap! Call Dominion Service Company for residential emergency service calls, and we’ll be there as fast as possible, 24/7! 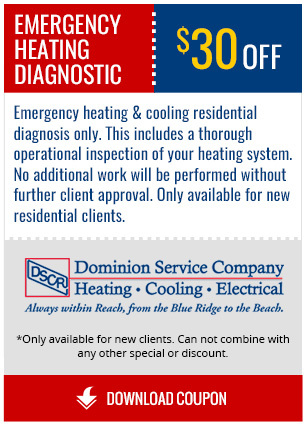 We service residential customers in Richmond and Hampton Roads, so if you’re in those areas and run into a heat pump failure or air conditioning break down and need emergency service, call our main office line at 1-800-832-0758 and we will be there in a jiffy! If you have any questions about how we handle emergency heating and cooling service calls, the specific markets or areas we cover for residential emergencies, or to ask us a specific question about your particular emergency, contact Dominion Service Company online or call us anytime at 1-800-832-0758. If you are in the midst of an residential emergency, call us now and we will get there asap! Do you need commercial HVAC help? Learn more about commercial emergency repairs.